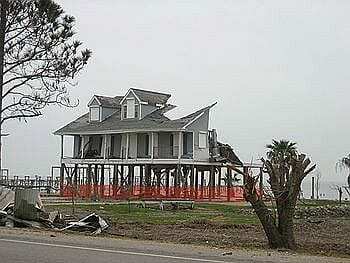 On a day in 2005, I awoke to news reports that the big one was rapidly approaching the Louisiana coastline. Hurricane Katrina was a Category 5 hurricane with sustained winds of 160 mph. There was no longer time to evacuate. In actuality, until the evening of Friday, August 26, Katrina had been a Florida storm. 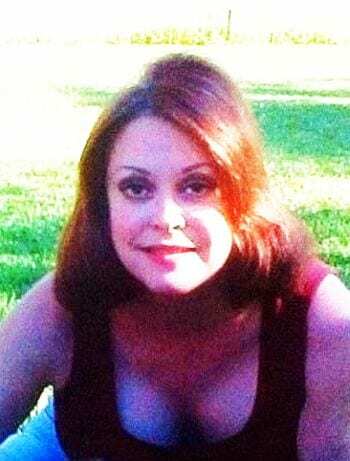 I was at a bar in Lake Catherine, Louisiana that Friday night. My husband was performing at what proved to be the final show the establishment would ever host. In less than 60 hours the building would no longer exist. Neither would anything else on that particular spit of land. People were quick to judge why more didn’t evacuate. The fact is, there was very little time. If you didn’t evacuate by Saturday, August 27 before 12:00 noon, it was already too late. Our home had survived Hurricane Camille in 1969, and as we are on the highest ground in the area, we decided to stay and ride out the storm. Preparations were made the best we could. The large generator I had requested as my Christmas gift the previous December was moved from the garage to the gazebo just off the back porch. 60 Gallons of gasoline were stashed around the property, securely hidden so looters could not easily find it. Our vehicles were garaged, mine in the old barn on the back of the property which once housed the Johnston family’s cow decades before. All objects that could become projectiles were stored or secured. The generator was chained to the gazebo with a heavy lock, and the gazebo itself was tied to an enormous oak tree. Plywood was hung on all the windows and doors. The house was dark with only small peepholes of light available through a few knotholes in the wood. The larder was full, bottled water at the ready. My last purchase before the stores closed Saturday morning was a large supply of charcoal for outdoor cooking once the storm had passed. There was nothing left to do but wait. We went to bed on this night in 2005, not knowing if we would wake in the morning. Then, at 5:02 a.m. on the morning of August 29, 2005, the power went out. The storm had arrived. I cooked all that Sunday knowing we would need hearty food in the coming days. I started a large pot of red beans that morning to freeze, and then went to work on a standing rib roast for dinner. I knew that hot leftovers would be important so I made extra brown gravy. All the televisions in the house were turned on and I was kept company, though not comforted by, the one in the kitchen. We made sure that our valuables were secure and that our important papers were at the ready. Even then, Thor suffered from what veterinarians now refer to as “storm anxiety” and he was well medicated. I was envious of him. We made sure all the laundry was done and we filled the bath tub with water. By late afternoon, the storm’s feeder bands approached and the wind and rain became heavy. The roar of a 50 mile per hour wind foretold what was to come. Somehow that night we slept, only to be awakened by an explosion at dawn. The transformer on the electric pole in our front yard had blown. Electric power and water was now a thing of the past and would not return for many days. We had agreed that we would allow the generator to power the refrigerator and AC for two hours at a time and then we would turn it off for four hours. A small window air conditioner kept us cool at night but we knew we needed to ration our supply of gasoline to power the generator. That afternoon as the storm raged, I grabbed Thor and went to bed, pulling a sheet over my head because it was too hot for blankets. I realized it was of no value as protection, but it somehow comforted me. Johnny stood watch until about 2:00 p.m. when the eye of the storm rested above us. It was then that we ventured out onto the back screened-in porch and witnessed the destruction for the first time. The saddest thing we saw that day was no fewer than six dogs, terrified from where they had been, not knowing where they were going, run through our yard. We wanted to help them but knew we could not. 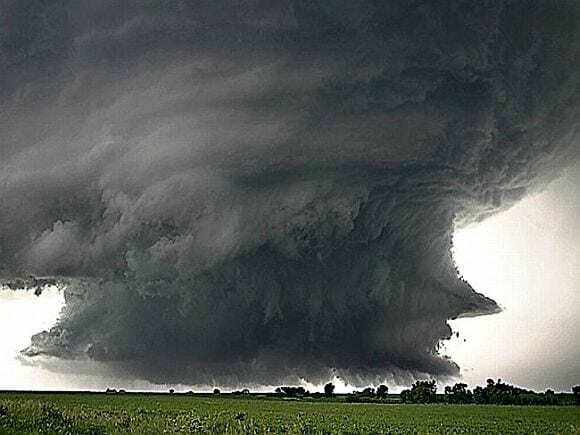 At about 5:00 p.m. the storm had passed over us and the northeast quadrant, or “dirty edge”, was wreaking havoc on Mississippi about 15 miles east of us. Johnny had begun his new job as the Band Director of Pearl River High School two weeks prior to Katrina. The high school, as well as the junior high and grade school in town were designated Red Cross shelters for those who could not evacuate. We were lucky. We were able to stay in our own home and no trees had crashed through our roof. Others were not as fortunate. On Tuesday, August 30, 2005, the skies were once again clear. It was hot, blistering hot and the day was unlike any other Tuesday. Our three-acre homestead was littered with hundreds of fallen trees and broken limbs. The driveway was impassable and our house could not be seen from the two-lane state highway on which we live. It was Louisiana State Highway 41 that proved to be our salvation. We knew the state would need to clear the roadway and restore utilities as soon as practicable. We didn’t know, however, that services would not be restored for another week. The radio was our primary source of news as the TV cable was out of order and would remain so for another 57 days. We rigged a wire hanger on an old television set to receive news while we ran the generator. It was then that we learned about the levee breaks in New Orleans. There was no telephone service and cell phone towers had been destroyed so communication with the outside world would have to wait. My husband’s elderly brother-in-law who lived next door suffered a heart attack and there was no means by which to hail an ambulance. His daughter, my husband’s niece, Rozalind, ran onto the roadway and flagged down one of the few vehicles traversing the dangerous highway. The Good Samaritan drove to the nearby fire station and an ambulance was dispatched. One of the paramedics had been a band student of Johnny’s several years prior. After depositing Russell at one of the two hospitals in nearby Slidell, she returned to check on us and provide an update on the damage around town. We were horrified to hear that parts of Slidell were under 6 feet of water. We knew that many of our friends were in serious trouble. Aside from our discomfort and inconvenience, we had dodged a bullet. 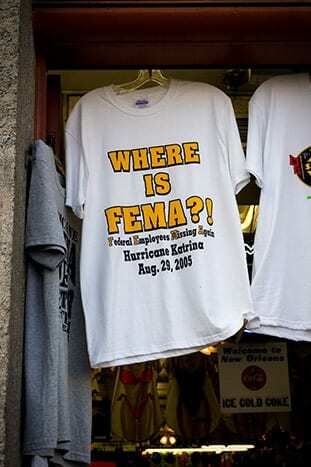 Days passed and still there was no sign of relief from FEMA or any other state or federal agency. Only the Red Cross and a few faith-based organizations were providing assistance to those in the shelters, and even the smaller shelters were closed leaving the high school the only bastion of hope for those in need. The St. Tammany Parish president ordered a curfew of 7:00 p.m. and halted the sale of alcoholic beverages. Looting was rife, and many neighborhoods placed signs at their entrances warning “trespassers will be shot on sight”. It was a lawless, frightening time. The main artery between the north and south shore of Lake Pontchartrain, the Twin Span Bridge, had collapsed. Only Interstate 12 between Mississippi and Baton Rouge remained open to emergency vehicle traffic. On Friday, September 2, I changed into clean clothes, put on my Angola State Prison hat over my unwashed hair, and packed a 22 caliber handgun and spare clip in my car to make the 120-mile drive west to Baton Rouge to purchase gas and supplies and to call my father in California. It was the first time we communicated since the storm. On the two-hour drive to Baton Rouge, the eastbound lanes were flooded with relief vehicles. National Guard troops and semi-trucks were finally bringing food in the form of MREs, water and ice. By the time I returned home, the Red Cross had fully ramped up operations at the high school. Doctors from as far away as Connecticut were seeing patients and dispensing medications. “Anything you want” said the doctor we talked with. We did not take him up on his offer. FEMA relief centers were finally established in convenient locations, four days after the storm, and we could drive through once a day to re-supply. 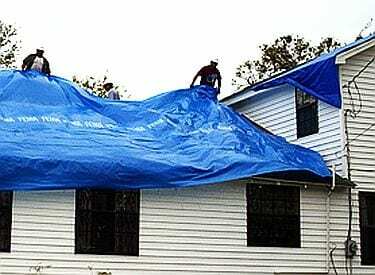 Blue FEMA tarps became “de rigueur” on rooftops, and many still exist today. The failure of FEMA was blamed on poor communication between Governor Kathleen Blanco, Mayor Ray Nagin and the Bush administration. Congresswoman Mary Landrieu explained that FEMA had been virtually dismantled after the crisis of 9/11 had subsided, and funding to the agency had been slashed. Too little was done far too late by the Bush administration. They even stopped calling on residents of southeast Louisiana asking for campaign donations for several years thereafter. Mississippi, with its Republican governor, Haley Barbour, fared much better than Louisiana. Once again, it was politics as usual. Volunteer organizations came to the aid of survivors long before FEMA arrived. And for us? Our power and water were restored one week after the storm made landfall. People in more remote areas waited as long as two months’ time. As I said before, we were very fortunate. The clean-up and the healing began and continues still, but nine years later, life is still not the same.